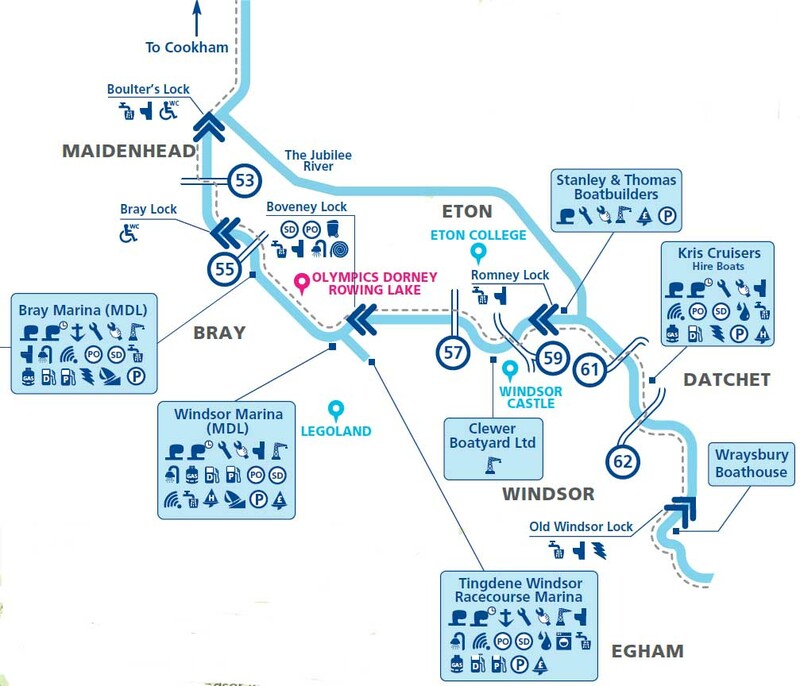 Note that the Bray pipeline figure is calculated as the Windsor Park Gauge less the Maidenhead Gauge less the Taplow Gauge. This assumes no other abstractions on this section. This new water main, extending to more than 17kms in length, enables the immediate transfer of an extra 23 million litres of water each day and helps South East Water provide drinking water supplies to the 300,000 houses in its supply area - as well as to new homes that are planned for the future. 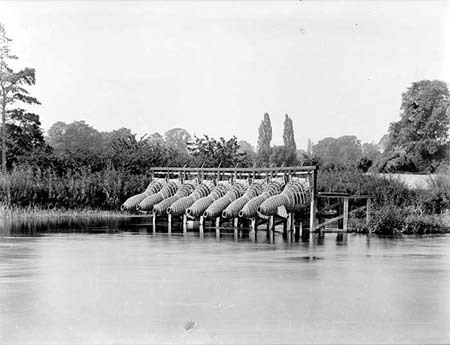 Water is extracted from the Bray Gravels and the River Thames [see note above] and is then processed at Bray Water Treatment Works before being pumped to the Surrey Hill Reservoir near Bracknell and the Crowthorne Reservoir. 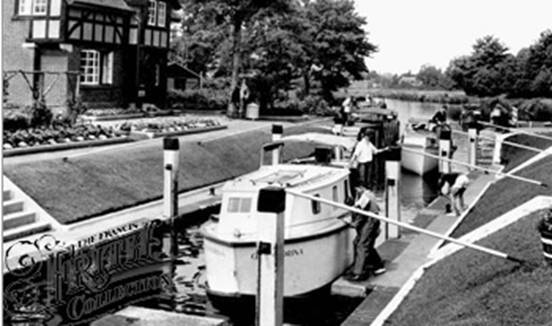 Right bank lock, tel: 01628 621650, length: 134'4", width: 17'11"
Bray Lock was once bypassed by the York Stream which went the other side of Bray and into Maidenhead. 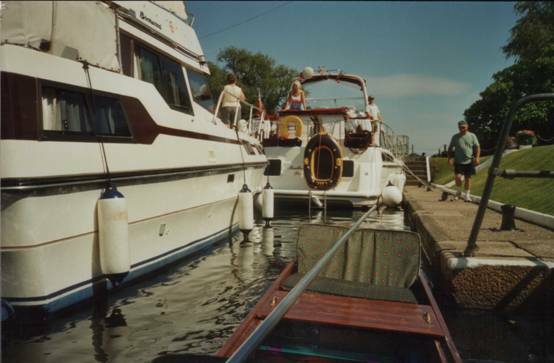 Amerden Camping on Right bank just below lock. Follow track about half a mile. No signs. Exposed mooring. 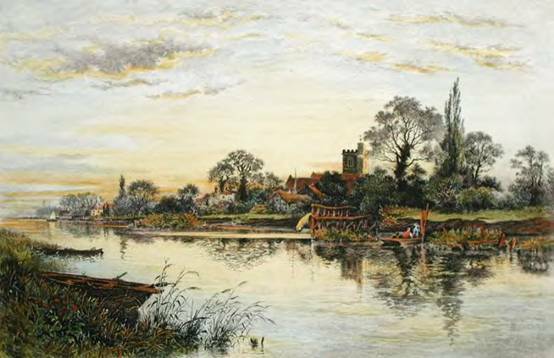 There is a mill here recorded in the Domesday Book – and therefore a weir. From [the “Holiport River”] thence to Bray-wharf the water is very shallow, there not being more than three feet three inches on several places, and there is a very awkward turn in the river opposite the Wharf, which greatly impedes the navigation; this turn should be ballasted away, and the channel made on the Buckingham side; and there should be two or three pile plank jetties erected on the Bray side, to keep the water in its channel, some willows might also be planted at the lower end of the ayt, to direct the stream into the new channel. Bray mill should be purchased, it is of little value, and the Water which is now used for the mill, being turned into the channel, will assist in deepening and keeping down the shoals. From thence to Amerton's [Amerden] lower farm there are only two shoals of little extent to be deepened; but there should be a channel ballasted out between the ayt and the Buckingham side. This channel was begun by the late Mr. Nickalls, but never finished. 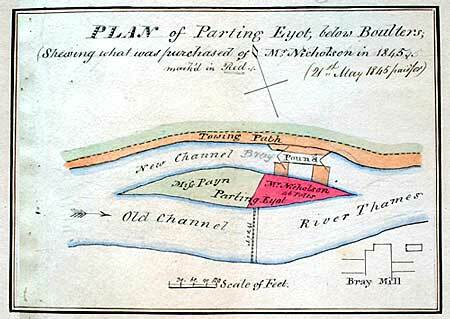 A jettie should be extended from the island towards the Buckingham shore, to direct the course of the water more into the channel - its lower end should be lengthened for about fifty yards by a willow hedge. 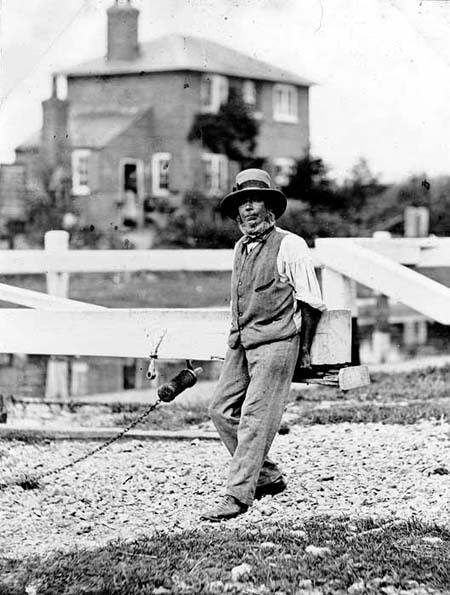 1840: The navigation channel was the present weir stream and barges were towed from the left bank, their lines sweeping the intervening island. 1865: Pound lock used only at low water times, being left open when the river was full. Hove to on Left bank just above Bray Lock. WM set to cooking in seclusion of cabin, and in due time filled the whole party with delight and with provisions of a most satisfactory kind (note very thick soup, rice, vegetables, meat, etc., results shewing both knowledge and skill). Cornell Price was appointed boteler by acclamation (his own). Liquor excellent. There was a man at work over osiers there, & made sort of stack of them. The bundles were useful at dinner time: wasps more plenty than welcome. Washed up and started again at 5 o'clock. 1885: Dickens – the lock was “a rotten and dangerous structure”. The fall was only a few inches. Both lock and weir were reconstructed. 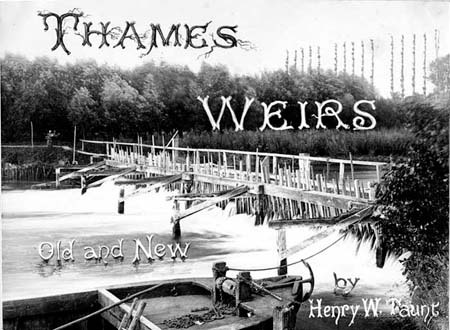 Bray Weir on the River Thames near Maidenhead was refurbished during the summers of 1993 and 1994. The existing structure, which had become unsound and unsafe to operate, was replaced by nine vertical-lift (or buck) gates. Construction works within a cofferdam and utilizing floating plant were undertaken in two phases. Following demolition of the existing weir, a network of reinforced concrete beams was supported on new driven piled foundations. Twin leaf gates slide in guides and span between new steel A-frames, and are lifted by pairs of threaded spindles rotated by actuators operating through gearboxes. Fine flow control is achieved by allowing overtopping of the upper leaves of the gates. Following commissioning, operational difficulties resulting from seal vibration and excessive friction on the spindles necessitated design modifications. The vivacious vicar [of Bray] living under King Henry VIII, King Edward VI, Queen Mary, and Queen Elizabeth, was first a Papist, then a Protestant, then a Papist, then a Protestant again. He had seen some martyrs burnt (two miles off) at Windsor, and found this fire too hot for his tender temper. "Not so, for I always kept my principle, which is this - to live and die the Vicar of Bray". 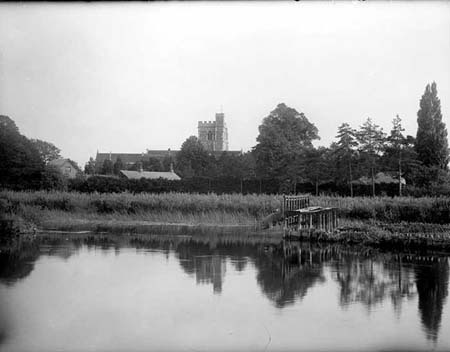 WHETHER this Vicar of Bray, the object of so much raillery, ever existed at all, or whether it was levelled at Vicars in general, I know not ; certain it is, that in the reign of Charles the Second, Dr. Caswell was Vicar of Bray, in Berkshire, near fifty years, and that he was not considered as particularly accommodating in his principles to the changes of the times. His successor, whose name was Brown, also held this vicarage fifty years ; and he too was deemed steady in his principles ; he died about thirty years since. These facts may possibly do away the imputation of apostacy from the respectable names I here mention. CHARLES the Second had been hunting in Windsor Forest, and in the chase was separated from his attendants. 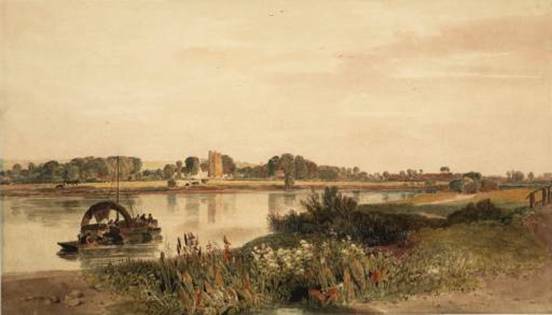 In returning, he lost his road, and came to Bray after it was dark, where, on enquiring for the Vicar's house, and being introduced, he told him that he was a traveller who had lost his way, and having spent all his money, begged that he would render him assistance to proceed on his journey, and that he would soon repay him with the greatest honesty. "The Vicar of Bray shall be Vicar of Bray still, but the Curate shall be Canon of Windsor." - and it is said that the King made his word good. 'Not so', said he, 'for I always kept my principle, which is this — to live and die the Vicar of Bray.'" I'll be the Vicar of Bray! Ritson, who was such an industrious collector of our English popular songs and their music, has given the words and tune of this song in his "Select Collection of English Songs", 1783; but he was not able to say who was its author, although it was evidently written not more than sixty years before that period. 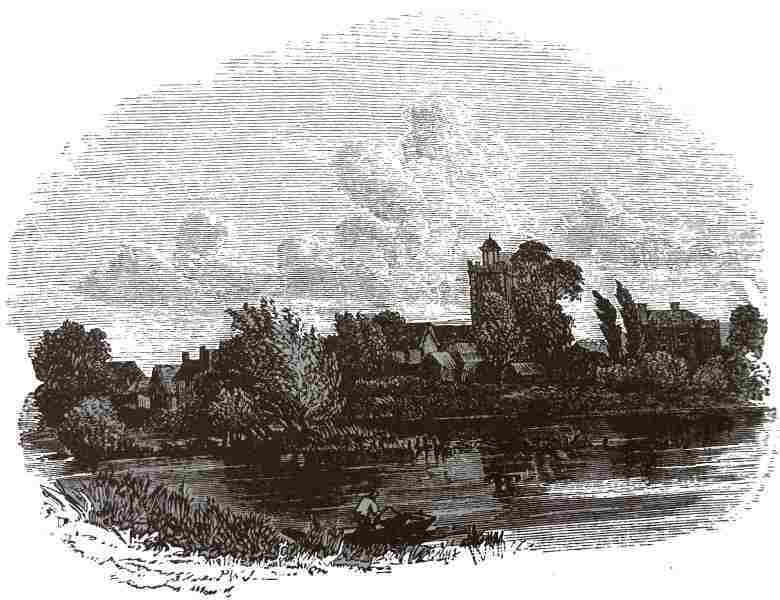 It was most probably the production of one of the men of talent who visited Touson at his house, close by Bray. In this church is still preserved one of those chained books commonly placed in the sacred edifice for general use in the days of the Reformation. 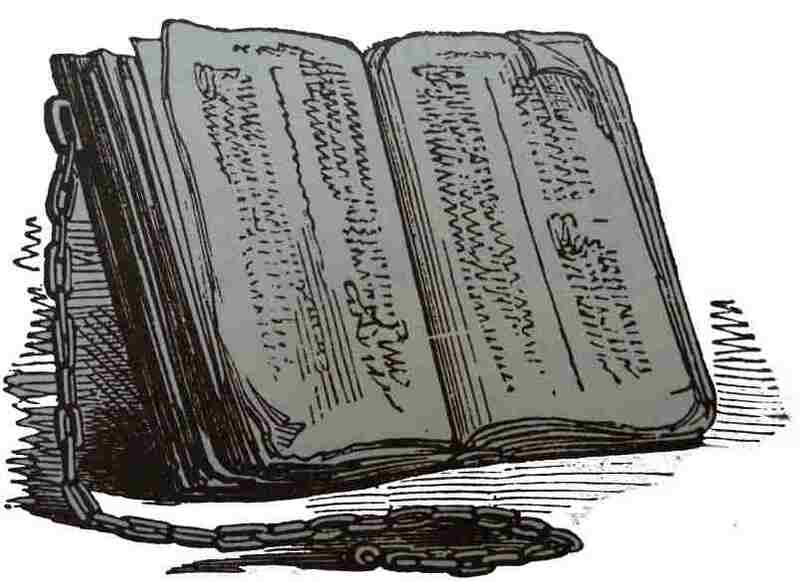 The custom began with the scriptures, which were thus chained to a desk for the consultation of the laity, "free to all men". The Bray specimen belongs however, to a later period, the days of Elizabeth, after the power of the Roman Catholic church had gained a temporary supremacy in the days of her sister Mary, who had, by her excess of severity, given greater stability to the reformed faith. The record of those who had suffered in the struggle was published by John Fox, and his "Book of Martyrs" became second only to the bible in general interest. It was placed with the sacred book for general perusal in our churches, and the folio still preserved at Bray is a tattered and well-worn copy of the famed record of the struggles of the early disciples of the Protestant faith. Listen to 'The Vicar of Bray' SAID! Your browser does not support the audio element. The body of Mr. Thamas Eade lies here. Nor turn out of the way for friend or foe. Because he would not walk in their strange ways. Unfortunately his memorial is horizontal in the centre of the church aisle and therefore he is continually walked over - which does seem strangely appropriate.